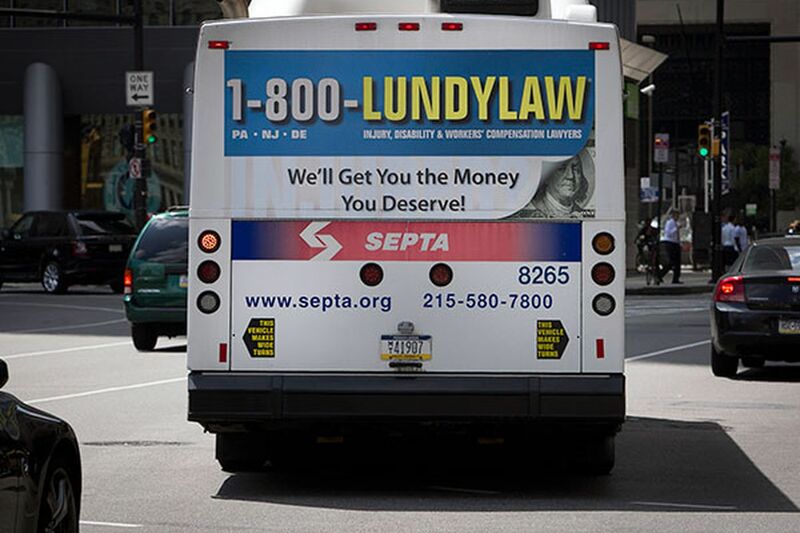 A lawsuit alleging that Lundy Law L.L.P., a worker-compensation firm based in Philadelphia, violated federal antitrust restrictions by locking up advertising on SEPTA buses and KYW drive-time radio has been dismissed by U.S. District Judge Cynthia Rufe. Rufe said Lundy, whose advertisements can be seen on buses throughout the region, had not breached federal antitrust laws because competitor Larry Pitt & Associates likely had other advertising options. At the same time, Rufe permitted Pitt to move forward with a claim that Lundy falsely stated in its advertisements that it handled Social Security disability claims when in fact it referred those cases to other firms. Rufe also gave Pitt the option of refiling its lawsuit on the dismissed charges by Jan. 3, but made clear that the firm would have to come up with new facts to support its claims. Carl Hittinger, Pitt's lawyer, said the firm planned to file an amended complaint with additional evidence. "Lundy Law clearly does not control all avenues for advertising in the Greater Philadelphia region," Rufe said in her 16-page opinion, released late Friday. Pitt sued in May, alleging that Lundy, by signing an exclusive advertising contract with SEPTA, was seeking to drive competitors out of the market. Both firms concentrate on worker-compensation and Social Security disability cases. Pitt is itself a prodigious advertiser in the Philadelphia region, and in its lawsuit, it maintained that the most effective advertising outlet for personal injury claims is the outside of buses. Rufe found that Pitt failed to show that Lundy had engaged in predatory or anticompetitive conduct. In fact, Lundy was responding to competition rather than trying to eliminate it, Rufe said. "This is not an antitrust case," said Robert Heim, the lawyer for Lundy. "There are many outlets for advertising, and exclusive contracts [of the kind between Lundy Law and SEPTA] are not illegal." Rufe said it may well be true that exclusive Lundy advertising on SEPTA buses, public buses in the Reading area, at the Wells Fargo Center and on KYW had been highly effective. But she said it did not necessarily follow that there were no other advertising outlets available. Pitt, moreover, likely had the option of bidding for the same advertising space once Lundy's contracts expire. "It is not clear from the complaint that Pitt has been or will be foreclosed from bidding for the very contracts from which Lundy Law now benefits," Rufe wrote. Hittinger said new facts that will bolster Pitt's case will be included in an amended complaint the firm plans to file by the Jan. 3 deadline. "The amended complaint will be based on additional substantial facts that have been uncovered through further investigation as well as right-to-know requests made to . . . various mass transit agencies, including SEPTA," he said.